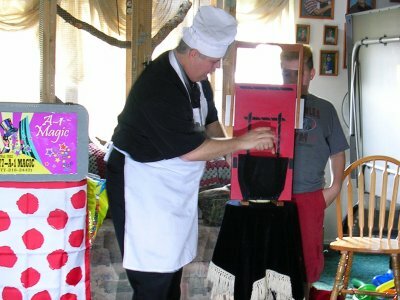 These are some of the illusions that can be performed with any of our Deluxe Birthday Packages. Keep in mind some illusions have restrictions. Click here for restrictions. The most popular Birthday Illusion we offer is where we float a child in the air. Preferably the birthday child, but due to height and weight restrictions, or even if the birthday child is too shy to participate, we can always use a sibling or friend to help. This routine is done to music. If the birthday child is too large for the levitation, this is the perfect illusion. 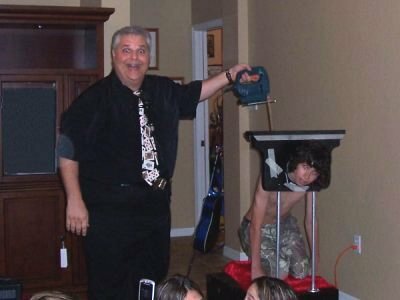 We put the child’s head in a box and stab it with balloon swords! But weight, when we open the box, the head is no longer there! A real “No Brainier”! This routine is done to music. A fun illusion for older kids. While demonstrating how safe a kitchen apparatus is, the birthday child gets their hand chopped off! But no worry, a little bit of Duck tape fixes anything! 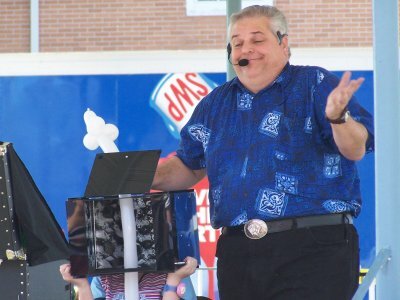 Teenagers as well as adults enjoy watching and participating in this hilarious illusion. We use a real saw and this trick is impressionable to younger children so we do not recommend doing this for anyone under the age of 12. This is a whole lot of fun but don’t lose your head over it!